Sorry for the radio silence over the past month, folks. January turned out to be quite a challenge. Beyond the minor-league distractions—colds and ear infections, dead laptop battery, flat tire, appointments, and out-of-town visitors—our son was diagnosed with Pervasive Developmental Disorder (PDD-NOS), an autism spectrum disorder. As you can imagine, the blog will be taking a back seat to occupational therapy and researching intervention resources and financial assistance, at least until we find our way back to an equilibrium. Despite our son’s developmental challenges, we feel very blessed that he is physically healthy and no more of a picky eater than your average toddler. I try my darndest to feed him the best food I can despite our financial situation, and where I know our diets are lacking, I just have to trust God to make up the difference. Many autistic individuals suffer from GI issues and sensitivities. 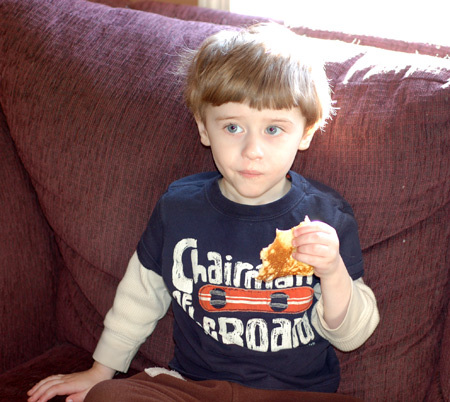 While our little Nolan has shown no indication of these problems, I have a few related issues myself and it certainly doesn’t hurt to play around with recipes that reduce our intake of complex carbohydrates and sugars. 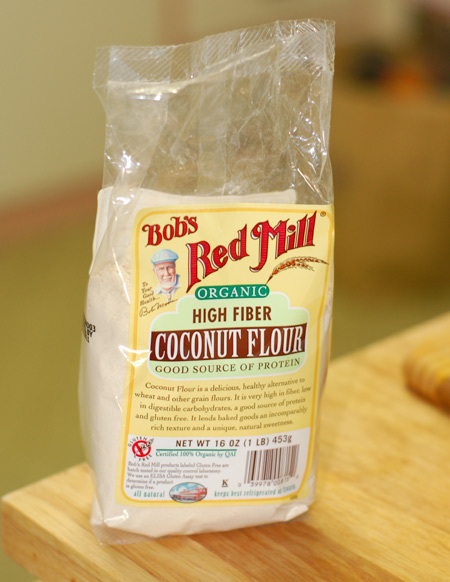 I’ve had my eye on coconut flour for a long time, and I finally picked some up to experiment with. Coconut flour is high in fiber and protein, low in carbs and gluten-free, and of course it tastes like coconut, which is a bonus in my book! 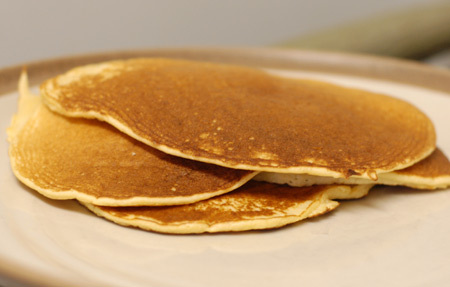 I made Nolan a half-batch of these coconut pancakes for lunch one day, and even though they came out kind of flabby and misshapen, he liked them so well that he ate all seven pancakes over the course of the afternoon. I took a simplified approach to the recipe—meaning I just stirred up the lot together and didn’t take time to whip the eggs—and they were ready to eat in just a few minutes, a must when your little guy is clamoring for more. I am sure the texture could have been better, so I’ll definitely try this recipe again, following the directions less casually to see if I can get that fluff. Preheat griddle over medium-low heat. In a small bowl, beat eggs until frothy, about two minutes. (This step can be omitted, but will make your end result less fluffy.) Mix in milk, vanilla, and honey. In a medium-sized bowl combine coconut flour, baking soda, and sea salt and whisk together. Stir wet mixture into dry until coconut flour is incorporated. Grease pan with butter or coconut oil. Ladle a few tablespoons of batter into pan for each pancake. Spread out slightly with the back of a spoon. The pancakes should be 2-3 inches in diameter and fairly thick. Cook for a few minutes on each side, until the tops dry out slightly and the bottoms start to brown. Flip and cook an additional 2-3 minutes. Serve hot with butter, coconut oil, honey, syrup, or fruit. To top off the coconut flour experiments, I also followed my instincts and went in the opposite direction: coconut crepes. 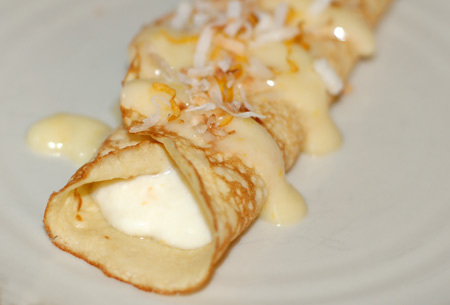 Coconut goes with so many flavors that I had a hard time narrowing down the filling options, and ended up making two different crepes, both based on a homemade yogurt filling. The batter was simple to mix up, and could be done using either a blender or some vigorous hand-whisking. It took a few tries to use an appropriately light touch when flipping the crepes, but Nolan was more than happy to do away with any evidence of torn crepes on my behalf. 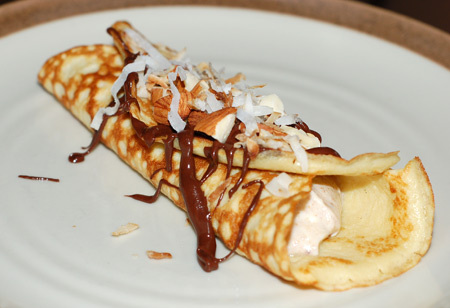 The first crepe, taking inspiration from Almond Joy candies, combined the coconut with an almond-yogurt filling and a melted chocolate drizze, with toasted coconut and almonds for crunch. 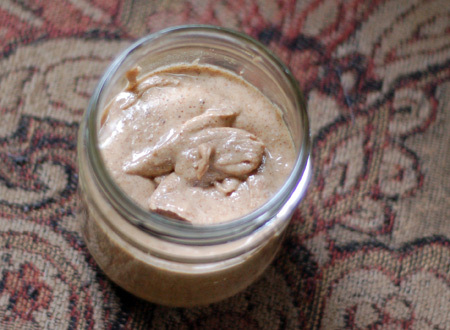 We had just run out of almond butter, so I decided to try making my own—toasted almonds in the food processor for about 10 minutes produced a much smoother nut butter than I had anticipated being able to achieve at home, and I will certainly be doing so again. The second crepe was courtesy of the alluringly fragrant Meyer lemons on my dining room table. I used just two lemons to make a small batch of lemon curd, reserving a bit of zest and some more toasted coconut for garnish. The curd was folded into more homemade yogurt with a little agave to combat the tang. 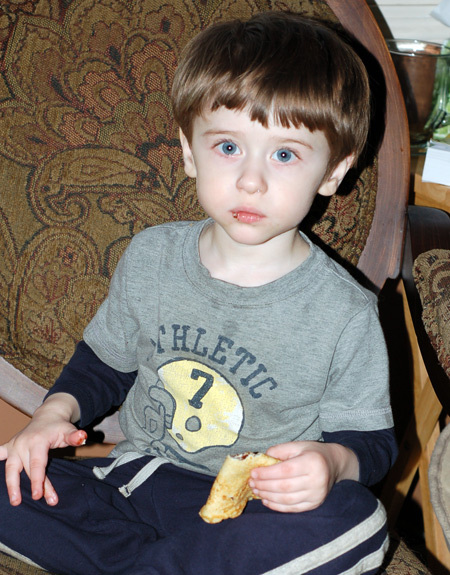 Nolan didn’t like this crepe at all, and since lemon is not my all-time favorite, I thought it was just alright. Although he was less excited about the crepes than the pancakes, Nolan still ate up all four of the leftovers, either plain or folded up with a smear of chocolate. That counts as a success in my book, and a good way to sneak some extra protein and probiotic yogurt into his diet. Blend together the eggs, oil, honey or coconut sugar, and salt. Mix in the coconut flour and add coconut milk. Heat the fry pan with a small amount of oil (I used grapeseed this time) over medium heat. As soon as it’s hot enough that water sizzles upon contact, pour 1/8 cup of the batter into the pan and swirl until a thin, even layer of batter covers the bottom. It should be about 5 to 6 inches in diameter. Cook until bubbly and cooked around the edges. Turn and cook other side until done. Serve with fillings of your choice—my all-time favorite crepe filling (and yogurt mix-in, for that matter) is pear-chocolate jam, but I am sadly out of that right now. Source: Z’s Cup of Tea. I am so sorry to hear about your son. Our prayers are with you.